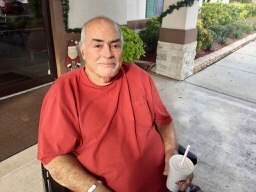 Harold "Crick" Simon Hatch, Jr.
Harold Simon “Crick” Hatch, Jr., 77, of Folkston, GA passed away peacefully at his home March 13, 2019. He was born September 3, 1941 in Morristown, New Jersey to the late Dr. Harold S. Hatch, Sr. and Wilnetta Brewer Hatch. He was also preceded in death by two sisters: Ruth Hatch Reiter and Mary Jo Hatch Thompson. He is survived by his son: Harold Simon Hatch, III, a niece: Suzanne Reiter Sexton (Ray), nephews: Jeffrey Grant Reiter, Randolph Hatch Reiter (Suzanne), Brian Addison Thompson (Sarah); grand niece: Lisabeth Bullock Pearson (Michael); grand nephews: Andrew Bullock, Theodore Clark Bullock (Audra), Jamie Reiter, Ross Reiter, Andrew Thompson; great great nieces and nephews: Elise Michaela Pearson, Theodore Charles Bullock, Abigail Bullock, Thomas Cameron Bullock and Anna Bullock. He is also survived by special friends: Dixie McGurn, Kathryn McCullough and many Rail fans. He graduated Rollins College with a degree in Theatre Arts. He then joined the US Navy serving as a Lieutenant with the Reconnaissance Attack Squadron. He received the National Defense Medal, Vietnam Service Medal, Vietnam Campaign Medal and the Navy Unit Commendation. Crick loved trains and spent many happy hours rail side at the Folkston Funnel. A graveside memorial service will be held Friday, April 26 at Jacksonville National Cemetery at 2:30 PM with Military Honors. A celebration of life service will be held Saturday, April 27 at 11:00 AM at the Miss Chessie Caboose, Trackside, Folkston, Georgia. In lieu of flowers, please make donations to the City of Folkston c/o the Folkston Funnel, The Forgotten Felines or the charity of your choice. Condolences may be expressed by signing the guest registry at www.shepardfh.com. Arrangements are under the direction of Shepard-Roberson Funeral Home in Folkston, GA. There's still time to send flowers to the Military Honors at the Jacksonville National Cemetery at 2:30 PM on April 26, 2019.